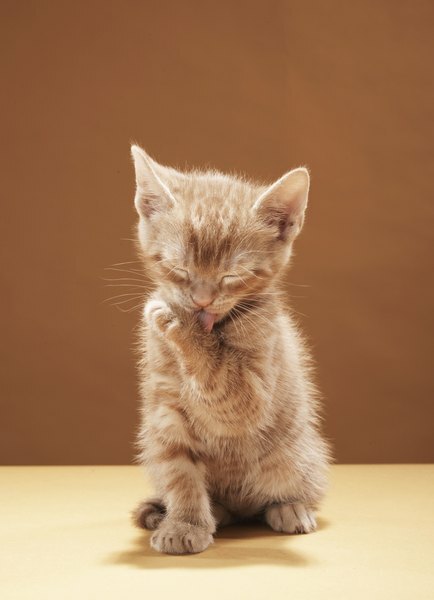 Cats spend several hours each day grooming themselves, but they can still use your help. According to the Humane Society of the United States, more than a third of U.S. households include at least one cat. While most cats are affectionate, intelligent and enjoyable pets, their shedding can be a problem. You cannot stop a cat from shedding, but you can take steps to reduce the quantity of hair that settles around your home. Your best defense against the onslaught of feline hair is daily -- or at least several-times-weekly -- brushing. Most cats enjoy a good session with the brush, but if yours doesn't, start off by letting her sniff and investigate the brush, then give just one or two gentle strokes before putting the brush away. Build up the brushing sessions slowly until your cat tolerates a thorough grooming. Slicker brushes or shedding combs dig down deep to remove loose hair. Brushing your cat also reduces the amount of hair she swallows while grooming, thus cutting down on unpleasant vomiting of hairballs. Diet plays a role in the health of your cat's coat. Feeding low-quality food with a high content of grains and carbohydrates, instead of the hearty helping of the protein and fat cats need, can lead to excessive shedding, dandruff or other skin and fur conditions. Look for a balanced cat food that has a protein source as the first ingredient, not wheat or corn. Both canned and dry cat food are healthy choices, but canned food offers extra moisture, something many cats don't get enough of on their own. When you own a cat, the vacuum cleaner is your friend. Plan on vacuuming at least once per week, more often if you have multiple cats, a family member suffers with allergies or you just can't stand to have hair on your carpets and furniture. Look for a vacuum that specifies it does a good job on pet hair, and includes accessories for cleaning upholstery and draperies. Though bagless vacuums are convenient, cat hair can eventually clog up the filters and motor, reducing suction. Clean your vacuum's filters and rollers frequently to keep it working smoothly. Sometimes excessive shedding indicates a medical condition that needs treatment from your veterinarian. If Fluffy has bald patches, scratches herself frequently, has reddened skin or sores, or just generally appears unwell, it's time for a visit to the vet. Health problems that affect the coat include allergies, thyroid or other hormonal imbalances, pregnancy, stress and infections. Your vet will examine your pet and recommend treatment for any diagnosed disorders. If your pet has allergies, your vet may prescribe special food formulated for sensitive cats. Country Living: How Can I Stop My Cat From Shedding? Pets Adviser: Why Does My Cat Shed So Much? What Kind of Cat Does Not Lose Fur?